Because of these unique program features, one of the over-arching goals of Hive Fashion is incubating innovation. To this end, Hive Fashion administrators have developed a unique approach to program development called the “Fishbowl.” Just as a fishbowl is transparent, the member organizations receiving Hive Fashion funding are committed to a transparent program development process that allows network members to learn from one another’s successes and struggles, thereby strengthening the entire network. A big part of this Fishbowl approach consists of member organizations coming together not only through their various collaborations for youth programming, but also for periodic meetups, workshops, and professional development sessions. These activities allow program administrators and educators to share updates on activities at their respective organizations and engage in a collaborative learning experience. They also participate in monthly cross-city calls and in an online forum where ideas can be shared and problems tackled collectively. In many ways, Hive Fashion represents a connected learning experience for the adult educators as much as the youth participants. In addition to thinking carefully about the Hive Fashion experience for the participating organizations, Hive Fashion administrators meticulously conceptualized the youth experience. From the outset, Hive Fashion was designed to follow Connected Learning Principles. Hive Fashion administrators have planned for public accessibility of student work across projects for the duration of the initiative. Through the use of existing social media outlets (Tumblr, Twitter, Instagram, and Facebook), individual programs are invited to collectively showcase student work, highlight innovative projects, and publicize upcoming events under the Hive Fashion banner. Administrators also fostered strong working relationships with the people and institutions connected to the fashion industry, including Chris Bevans, the Creative Director for Pharrell Williams’ Billionaire Boys Club fashion line, Parsons the New School for Design, b michael, and Burberry. 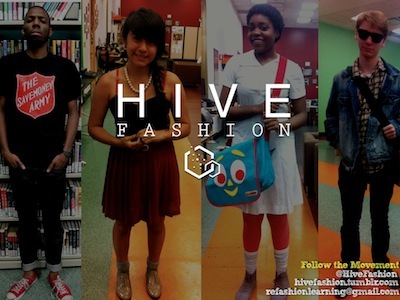 Hive Fashion programming exemplifies Connected Learning principles by making clear connections from interest-based activities to career-relevant skills, relationships, and pathways. In addition to a focus on skills, the programming and mentoring creates spaces for teens to develop relationships with peers and adults who can support their interests and connect them in concrete ways to new kinds of opportunities. The program design is built on the recognition that young people need relevant personal relationships and career-relevant opportunities for their learning to make a difference in the real world. Because Hive Fashion represents a loosely connected constellation of organizations united by a common funding theme, we will focus on the efforts of two programs, one in Chicago — Style Bias — and one in New York—DreamYard Fashion—to highlight Connected Learning Principles in action. The Style Bias program is housed in the YOUmedia space at the Harold Washington Library in downtown Chicago. The program supports teens with various fashion-related interests and connects them to both mentors and industry partners who can help nurture and develop those interests. While the program is fashion-centered, it allows teens to explore their interest in fashion from multiple entry points, including style blogging, fashion photography, clothing remixes, fashion design, and experimentation with multiple types of technologies that support the design process (e.g. Adobe Illustrator and Photoshop). This flexibility in focus allows teens to participate at the level they feel comfortable with and gives them the opportunity to combine multiple interests (e.g. blogging and fashion or photography and fashion). Mentors also actively help youth at YOUmedia who might not be explicitly interested in fashion connect their interests to the Style Bias project. For example, Mike, a mentor at YOUMedia, tracked down a teen he knows has experience making beats and told the teen, “I have a question for you…no, an opportunity.” He explained that they have a lot of videos being made for the fashion program and asks if he would be interested in helping out by making soundtracks. In response, the teen offered Mike his headphones so he can hear some beats that he’s made. Mike listens for a few minutes and compliments the boy on his work. They decide he will help compose the music for the fashion videos. 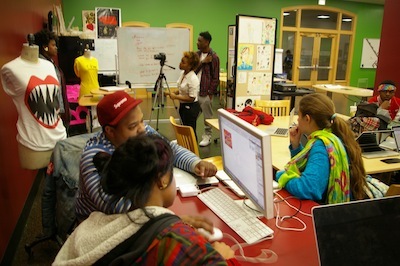 The open floor plan of YOUmedia Chicago means that other youth in the space are able to observe the activities happening during Style Bias programming. One of the mentors has set up a makeshift photography studio in the back corner of YOUmedia which has a white backdrop with a large white cube and a tall, narrow orange stool as props. When Style Bias teens are using the “studio”, other teens in the space are free to observe the shoot. One teen who saw these activities mentioned to a mentor that she was interested in fashion, but didn’t think she was much of an artist and that she was unsure of how to get involved. The mentor, Mike, explained to her that everyone has different strengths and there are many different ways of being part of the team. He tells her that the first thing she should do is start looking for creative inspiration, and pulls up some websites he uses for design inspiration on her laptop. He notices her notebook, which is open to a page with a small drawing, and gives her some encouragement around her design skills commenting, “Even this, on a t-shirt, would be super fresh.” The teen was excited and spent the rest of her time at YOUmedia scouring the internet for design inspiration. Although much of the Style Bias programming is structured, teens also have time to socialize with other participants and with other teens in the YOUmedia space. They are encouraged to provide feedback to each other and to engage in constructive criticism, a skill that is actively fostered by the mentors, both during weekly in-person meetings and in the online Hive Fashion space created on the iRemix platform—a closed site that allows teens to post work, collaborate, and get feedback from peers and mentors. Both the online and physical Style Bias spaces focus on skill development and collaborative interaction, but they also allow teens from various schools within the city and suburbs to connect informally with others who share their interests. Teens often comment that participating in programs like Style Bias help form friendships with peers who share their interests and career goals in ways that would not be possible in their schools or neighborhoods. The Style Bias mentors have cultivated working relationships with professionals in the field of fashion to connect youth with multiple outside opportunities. One of Style Bias’ current projects is a collaboration with a well-known independent Chicago boutique. This partnership allows teens to not only build the technical skills and provide “real world” validation for their products, but also gives them the opportunity to see how these skills are applied in a professional setting, experiencing first-hand the artistic and career challenges associated with producing a specified product for a target audience. Through this and other projects, teens are able to connect with artists, designers, stylists, and other professionals who have furthered their own interests in fashion through higher education and fashion careers, applying the same skills they’re learning at Style Bias in academic and career settings. This contact with industry professionals and expert mentors in residence at YOUmedia help provide teens with career pathway blueprints they can use in pursuing their own goals. Style Bias also employs badges as a way to make pathways for mastery visible. These badging journeys, which showcase student achievement from initial skill building through mastery of complex skill sets, help youth develop an understanding of how their skills might become more developed and advanced. This type of skill exposure and endorsement is especially important because young people rarely have the opportunity to study or specialize in fashion design in middle and high school. The Style Bias mentors also push teens to connect their fashion work to the larger cultural context of the city of Chicago. Youth are encouraged to move beyond the familiar YOUmedia environment and to view their work through the lens of social justice by incorporating social, political, economic, and cultural perspectives into their projects. Teens are challenged to reflect on how their work represents their self-identity or how it relates to a specific theme. For example, they were asked to remix the logo of a local boutique store to reflect their experience as a teen growing up in Chicago. To do this, they considered their own identity as Chicagoans and thought about which visual symbols represented their city. In addition to in-person design projects, mentors employ their online site to help youth make connections between different cultural expressions, such as Hip Hop and fashion, or the representation of different cultures and identities in downtown Chicago through “Street-Style” photo shoots and blog posts. As Style Bias progresses into the summer, youth will continue to consider how to make a fashion line culturally and socially relevant as they design clothing that represents them and appeals to their like-minded peers, a process that will integrate young, urban, and digitally informed design elements. The focused projects within the Style Bias program allow teen participants and adult mentors to come together to work toward completing project goals. Whether it’s a simple, single-day project such as capturing “street style” photos for the blog, or a lengthy, multi-phase project such as seeing a fashion design completed from concept to final production, youth are able to work with both peers and adults to build skills and create shareable products. Teens have also been challenged to re-design their partner boutique’s logo, and will see their projects through all phases of the design process, from developing an initial concept to pitching their final design. Eventually, one or more designs will be featured on apparel to be sold in the boutique. These types of design challenges help develop cohesion among participants and mobilize their interests. Style Bias has maintained a focus on production as a means of building skills and achieving goals in both large and small scale projects. Mentors provide individual support for the development of technical skills through the design and production of various artifacts including photos, blog posts, images, and actual garments. When working on the boutique logo design challenge, a mentor, Avri, spent one-on-one time helping a teen, Sasha*, learn an advanced skill in Adobe Illustrator. On the large Mac desktop situated between them, a photo of a woman’s hand had been opened in Illustrator. Avri had control of the mouse, using it with his right hand while he pointed to the screen with his left hand. The teen sat, chin on her hand, intently watching his actions on the computer. Avri tilted the computer screen towards Sasha and gave her the mouse, letting her practice the new skill. After a few minutes, she grew frustrated trying to fix her image, sighed loudly, put her head down and turned the monitor toward Avri. “Relax…breathe…”- he said, smiling. He took the mouse and showed her how to change the color to fill in the entire outline of her image. “Ohhhh!” she exclaimed excitedly, then started experimenting with the custom color palette to change the color. This kind of targeted instruction allows teens to develop specific skills which can then be used to meaningfully contribute to large scale projects or to their individual work. 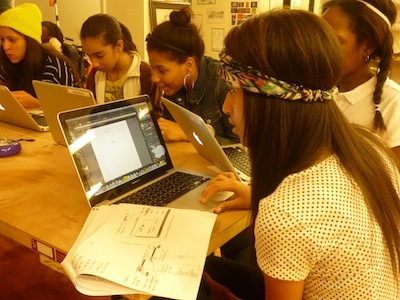 By working together on group projects and on iRemix, teens also develop collaboration and critique skills necessary for work in the fashion industry. The Hive Fashion iRemix site also gives teens the opportunity to connect online with both peers and mentors. As mentioned earlier, the iRemix site serves as a closed social network, allowing teens to connect with like-minded peers, providing a space to showcase their work, provide critique to others, and coordinate projects and ideas. Projects at all stages of development are curated in galleries within this site. Teen profiles display badges earned for participation on the site, and others conferred by mentors for mastery of certain skills. They are also able to easily export their work from iRemix to the public-facing Style Bias blog, Facebook, and Tumblr. The Style Bias mentors use social media such as Twitter, Facebook, and Instagram to connect with teens, showcase student work, and advertise activities. Style Bias represents a unique opportunity for Chicago youth to pursue fashion, an interest often not well-supported in traditional educational institutions. The program design creates low-risk, low-barrier entry points for teens who are just beginning to explore this interest area by showing them how to combine fashion with other existing interests, like blogging, photography, graphic design, or illustration. Teens develop project-relevant skills and are able to apply them in professional contexts through partnerships with local professionals. By cultivating these relationships with local artists and professionals, Style Bias mentors serve as connectors who help youth bridge the gap between their interests and potential career and academic pathways. Because of its downtown location, Style Bias allows teens to connect across the neighborhood lines that typically divide up Chicago and gives them access to a more diverse group of peers who share their interests. Like other Hive Fashion programs in Chicago and New York, Style Bias focuses on production and the sharing out of design work, but it also has unique features that can make it a challenge to replicate in other sites. 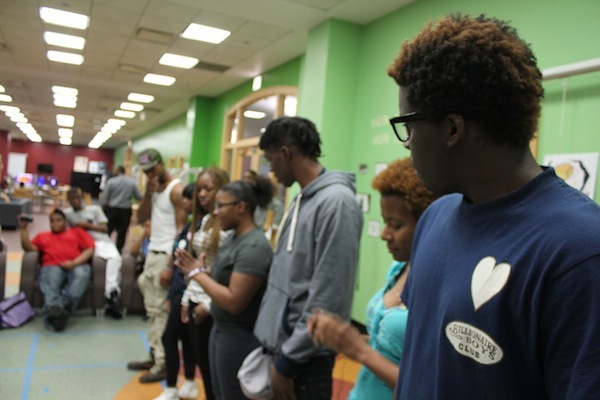 The large open space of YOUmedia Chicago and the drop-in nature of the space lowers barriers and increases opportunities for participation by making programming highly visible and allowing teens to observe before jumping in. YOUmedia Chicago mentors have also had a head start on iRemix, and are able to more effectively incorporate it into their programming than many other sites. Finally, the Style Bias mentors’ extensive backgrounds in the fashion industry have created unique opportunities for participants. The mentors’ personal connections have allowed teens to connect with industry professionals and special events at various Chicago fashion venues. Although other Hive Fashion programs utilize professional teaching artists as mentors, the fashion-specific background of the Style Bias mentors stands out. As the Hive Fashion program develops, it would benefit from greater connectivity between programs like Style Bias at YOUmedia Chicago and other fashion-focused programs in Chicago, New York, and beyond. Currently, the constellation of programs participating in Hive Fashion operate largely independently. Teens who participate in Style Bias at YOUmedia tend to stay at YOUmedia and are not taking advantage of the other fashion programming opportunities in the city. Periodic Hive-wide fashion events are the exception, where youth from different programs have the opportunity to connect with one another. Creating pathways between different programs would require more explicit forms of cross-promotion and sharing between different institutions. Online media provides the potential for this kind of cross-site linkage, if the diverse sites and platforms could be better connected and integrated. Broader networking would allow youth to gain access to additional learning opportunities, enable them to collaborate and share work with a larger group of programs and peers, and connect them to more youth and adult mentors with similar interests. Badging presents another opportunity for youth to connect their developing skills to other programs and to more real-world academic and career contexts. Many of the skills that teens learn through Style Bias and other Hive Fashion programs may go unacknowledged in more traditional academic spheres, but badging allows teens to showcase their developing skills in a way that is understandable to both fashion-insiders and those in other settings. This opportunity could be more fully developed if Hive Fashion programs implemented a common badging system that was transferable across sites and programs. A common system could allow for more cross-organizational programming and skill development, and could facilitate having the skills recognized in more professional settings. DreamYard is an arts-focused organization housed in a residential section of the Bronx. In addition to inspiring youth to pursue their interest in the arts, DreamYard also provides supports for young people as they navigate their own unique educational pathways. This includes assisting youth in reaching their goals around higher education, careers, or civic engagement. 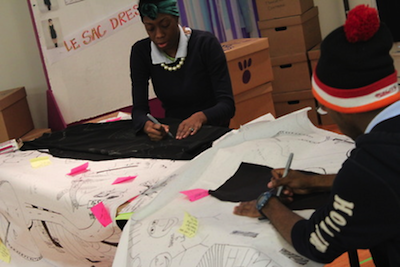 One piece of this complex puzzle is DreamYard’s Hive Fashion programming, which helps youth with an interest in fashion learn about the design process from initial concept to completed product. The DreamYard Fashion (DY Fashion) program began in August 2012 with a fashion week that culminated in a fashion show of youth designs. Participants remixed their looks, using vintage clothing, from design to finished garment and then walked the runway to showcase their work. Building off the success of this one-week event, Cydney and Moriah, two DreamYard mentors, created a 24-week long fashion program that launched in October 2012. 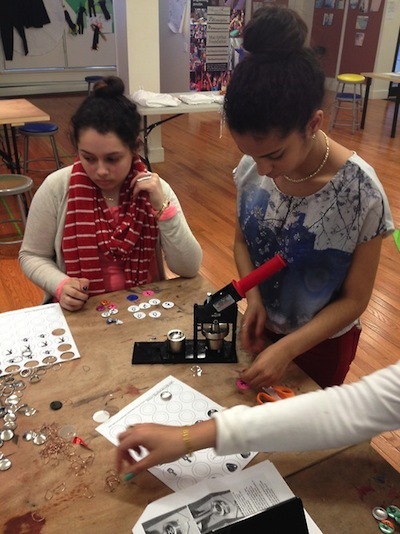 The programming introduced teens to a wide variety of fashion-related skills—from sewing to button making to jewelry design. The final project for this program series is a pop up shop where teens sold their products to family and friends. The idea for DY Fashion was originally prompted by experiences a mentor, Cydney, had with teens who were interested in how she cultivated her own unique style. From these interactions, she knew there were teens who were excited about fashion and curious about how to develop their own wearable art. Cydney works with Moriah, a mentor and designer of her own fashion line, to help youth develop their fashion skills at DreamYard. Teens come to DY Fashion for a wide variety of reasons. The majority chose to participate because they had a pre-existing interest in fashion and wanted to deepen their fashion knowledge and skills, with many indicating during interviews that they plan to pursue a career in fashion. These teens typically don’t participate in other DreamYard programming, choosing instead to focus exclusively on fashion. Other teens were exposed to the fashion programming by the prominent displays of fashion participants’ work in the space. These teens joined the program because the openly networked nature of the DreamYard space allowed them to be exposed to fashion as a potential new interest, rather than because of a preexisting interest. Thus, youth who were observers were able to become active participants. Cooperation and collaboration between teens is highly encouraged at DY Fashion. The atmosphere is collegial and teens are generally friendly, have fun, and are playful with each other both during and between workshops. They are also inclusive. In one instance, John, a teen, went out of his way to pull up an extra chair at a table that was full so that a teen eating alone could join them. Because of the supportive culture, which is fostered by the mentors, youth are readily willing to help their peers and share their ideas freely. During a jewelry making workshop, teens were constructing pieces based on images they had found and manipulated in Illustrator. These images were then used to make cutouts from plexiglass and wood. A young woman, Mia, decided to create a pin by layering a smaller plexiglass cut out of her image with a larger cut out of that same image made from wood. She also decided to adhere two same-size pieces of plexiglass together to construct a thicker, more solid piece of jewelry, which she turned into a pendant. When other participants saw her innovative approach, they quickly began to adopt it. Instead of being bothered by peers ‘copying’ her work, Mia was excited that they liked her ideas and she worked collaboratively with others to help them glue and pair their pieces. Other teens swapped their cut outs – each teen had designed his or her own image – so that they could construct jewelry with multiple images. Although the fashion programming at DreamYard is highly structured, teens still have space to interact socially. DreamYard staff have also created an open studio time so teens can hang out in the space informally to work on their own projects or complete projects started in class. 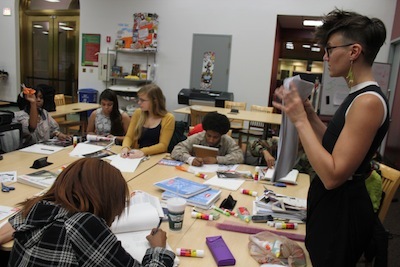 During open studio, teens tend to spend time socializing or singing karaoke. This time is youth directed, but adult mentors are there to support them. Although no one directs their work, the Hive Fashion group uses this time to complete projects specifically for the popup shop. Teens report that they come to open studio to see their friends and work on their projects, but also to spend time with the mentors. The teens rely on the support, both social and content related, that the mentors are able to provide, and they value these unique intergenerational relationships. DY Fashion enables teens to more deeply pursue their interest in fashion while developing career-relevant skills and connections to academic opportunities. Terry*, a participant, explains that even at his art-focused high school, he didn’t get the types of hands-on experiences he was able to get at DreamYard. With guidance and support from the mentors at DreamYard, he was also able to construct a portfolio of his design work that he plans to submit to colleges when applying next year. The mentors also spend time teaching the teens how to price their merchandise and interact with potential customers, skills beneficial in the working world. The mentors explain that pricing depends both on the price of the materials used to create the piece and the value of handcrafted, original designs. Before the popup shop where teens sold their jewelry, the mentors made sure they understood how to calculate the cost of their jewelry given the cost of plexiglass and wood they used to craft them, so that they see a return on their investment. The mentors also stress the importance of interpersonal interactions during the popup shop. Moriah, who has her own professional fashion line, described for the teens how she interacts with potential buyers during a trunk show explaining that she is very friendly, welcomes people, and answers their questions. She explained that part of running a popup shop is being personable saying, “Greeting is important because it gets people to come over and talk to you.” She encouraged teens to “talk about their logo, explain their inspiration and talk about their process,” explaining that buyers like to hear about the design process. Moriah also talked with the teens about the beginnings of her company and how they might transition to full-time fashion designers. Helping teens envision potential academic and career pathways they might follow in order to pursue their passion for fashion is a key component of DY Fashion. In addition to having immediate access to a mentor who is a professional clothing designer, teens were also able to take a field trip to visit the headquarters for renowned designer b michael. Here, teens were able to gain first-hand knowledge of how a fashion company is run and were able to talk with b michael about his experience in the fashion industry. 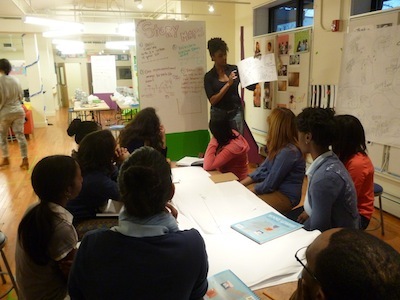 Having a professional designer in residence at DreamYard and connecting teens to other successful designers helps teens envision pathways between their current interest in fashion and potential career pathways. Teens say they haven’t found the support and knowledge they gain from mentors at DreamYard elsewhere in the city. Like the Style Bias program in Chicago, DY Fashion emphasizes the importance of production in skill building. 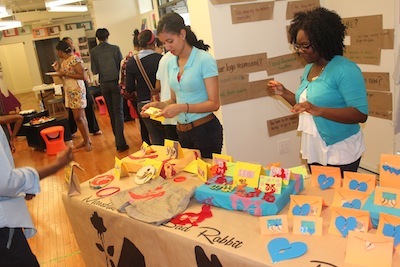 Teens created their own clothing, silk-screens, earrings, pins, and other jewelry. While much of the creation done during the DY Fashion program is analog, the mentors also employed digital tools to help develop the teens’ fashion skills. During the original fashion week, participants were introduced to Pinterest, a free, online tool for collecting and organizing interesting items or images from around the web, to digitally curate their fashion inspirations. These became online photo albums where teens could easily gather digital images to use as inspiration for creating their own garments. During the longer 24-week fashion program, teens learned to use Adobe Illustrator for various parts of their design progress—from following patterns to vectoring images. With help from their peers and the mentors, teens learned how to take a digital image and turn it into a physical product. Each teen designed a unique logo, using images found online, which they turned into vectors, or images that rely on mathematical equations to define shapes and lines and allows images to be scaled to any size without a loss in resolution quality. Then they prepared these images to be laser cut. Using technology for fashion designing was a first for some participants, with one student saying he had never used digital technology in this way before. His unique and unusual design brought together two of his favorite things, food and animals, by pairing a teacup and a squirrel. He said the he thought his design was funny and unexpected, and he used it to create pendants by creating large cutouts of his design in black plexiglass. Another teen created a logo by merging and manipulating two images–a unicorn and a cloud. She said her logo represented freedom because, “the unicorn is imaginary and flies up in the clouds.” She made buttons with her logo and created small cutouts of the design in plexiglass and wood. She used those pieces to create earrings and charm bracelet. The pop-up shop, held inside the DreamYard site, was the culmination of the fashion program. Over several weeks leading up to the shop, fashion participants created unique pieces including earrings, necklaces, and pendants from an original design they had created. When it was time for the shop to open, each student had their own booth to sell their wares, and also contributed buttons featuring their unique logos to a collective booth. The pop-up shop project guided the design work throughout the program because participants knew they needed to produce high-quality pieces that would be desirable for sale. Working together towards this shared goal, the teens, with support from the mentors, went through each step of the design and production process in preparation for this event. Although some of teens were a bit hesitant about their work, they were bolstered by supportive comments from each other and helpful advice and encouragement from adult mentors. The pop-up shop created an opportunity for teens to unite around a common goal and to come to DreamYard during open studio to meet with the mentors to further develop their work. The challenge of creating products to be shared with friends and family and to be sold kept teens consistently engaged in programming. Within the DreamYard space, the fashion program is highly visible. The main floor of the building has a prominent display of fashion designs, student-created clothing, screen printed t-shirts and dress patterns — all created by fashion programming participants. Moveable whiteboards that highlight the work teens are doing and outline the steps in their creative process. The fashion program also meets in the open space on the main floor of the building and for the last few weeks the space has been buzzing as budding designers put last minute touches on their handmade jewelry and clothing that will be sold at a popup shop. This openness creates visibility to teens not currently participating in DY Fashion, enabling them to observe the fashion-related activities, which might spark a new interest. Connecting the work teens are doing in fashion programming to friends and family is a core part of DY Fashion. Family, friends, and the larger DreamYard community were invited to attend the pop up shop, and they enjoyed refreshments, took pictures, and purchased teens’ products. To celebrate the teens’ accomplishments, each participant received badges for the skills they learned, from basic sewing techniques to using Adobe Illustrator. Parents were glad to learn more about the skills their children were developing through program participation. One mother said that she often wanted to come to DY Fashion programming to see what her son was up to. “He loves coming here,” she said. The mentors also helped teens host a DY Fashion open house, where friends, family, and the larger DY community were invited to come and experience a sample of DY fashion programming. Guests were able to be styled by a fashion participant and have their picture taken in their new look or take a crash course in sewing and make their own soft mobile phone cover. These experiences help parents, siblings, and friends gain a better understanding of the work DY Fashion participants do during programming and to connect DreamYard activities to home and community settings. Like Style Bias, the DY Fashion creates a unique opportunity for teens to pursue an interest that is not well supported in more formal settings. Teens were excited to have a space that provided them with connections to expert adults who shared their passion for fashion and who were happy to support their skill development. Through the connections to the fashion industry nurtured by the programming, both in employing a working fashion designer as a mentor and by field-tripping to the b michael design studio, teens were able to gain a more clear understanding of how to transition their current interest into a viable career. Throughout the fashion programming, adult mentors have discovered additional opportunities to create connections for youth and explore new learning experiences. For example, the process of creating the pop-up shop allowed teens to learn about designing, sales, and marketing. In preparation for the shop, teens were excited to create buttons featuring their designs, but their customized buttons did not sell widely. Neither did pieces with large-scale logos, such as earrings. Instead, signature pieces that were more modestly sized, like necklaces or charm bracelets, were the most popular. The mentors realized that in order to have a successful and lucrative shop, teens needed to think more about consumer preferences and possibly conduct some market research before creating their pieces to sell. In addition to the design work that went into shop preparation, they made money from selling their creations and also learned some valuable lessons about sales and marketing. The pop-up shop was so well-attended that adult staff are looking for additional spaces to host a shop outside of the DreamYard space, and they plan to make the pop-up shop a regular feature. 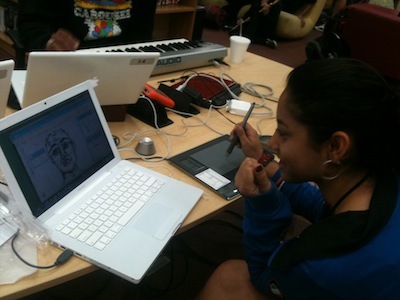 During DY Fashion programming, teens learned how to leverage digital technologies to design and produce their creations. Incorporating an even stronger online media component to the program might broaden access to the program, and provide more flexible and informal ways of engaging both during and outside program time. Asking teens to compose the posts on the DY Fashion blog, push their content out to other platforms, or support a social networking space they could use to connect with one another around their interest are possibilities for incorporating more social media. This would also create more openly networked spaces for fashion participants to connect with each other from multiple locations and create additional opportunities for peer-to-peer and mentor-to-peer feedback and critique. These types of online connections would enable teens who may not be able to come to the physical space for a regular meeting to keep up with the creative and production processes by accessing program content and the adult mentors online. While the visibility of fashion programming in the space introduces teens to a potential interest in fashion, joining the fashion programming mid-stream is a bit challenging because each week builds on the skills learned in the previous weeks. Although it is not easy to create a program with multiple entry points, it would be useful to consider how youth new to the program, or who attend the full sequence, could find ways to meaningfully participate.